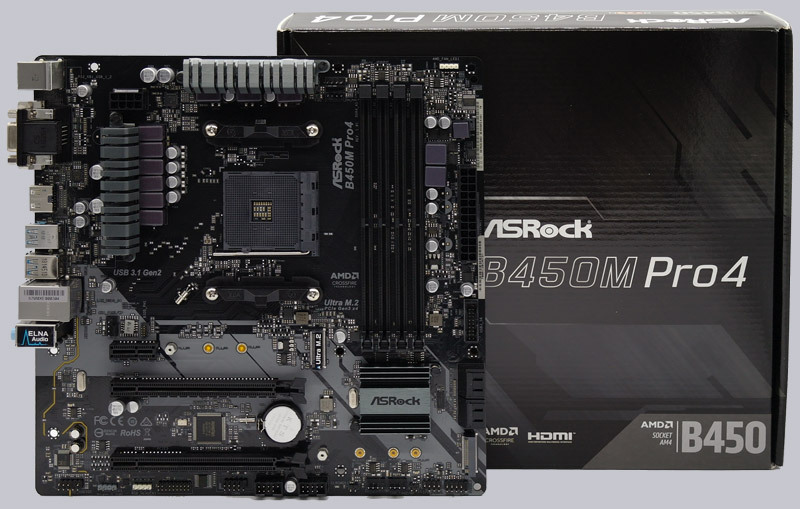 With the ASRock B450M Pro4 we test an inexpensive Micro ATX motherboard for the new AMD Ryzen 2000 CPU series. We have tested and overclocked this AMD AM4 uATX motherboard with an AMD Ryzen 5 2400G processor with integrated GPU and with an AMD Ryzen 7 2700X CPU. Since the ASRock B450M Pro4 is backwards compatible to the first AMD Ryzen 1000 CPU series, we have also tested it with the AMD Ryzen 7 1800X CPU in comparison to the AMD X370 and B350. We have compared the AMD Ryzen 2000 test results to the previous AMD Ryzen 1000 series as well. 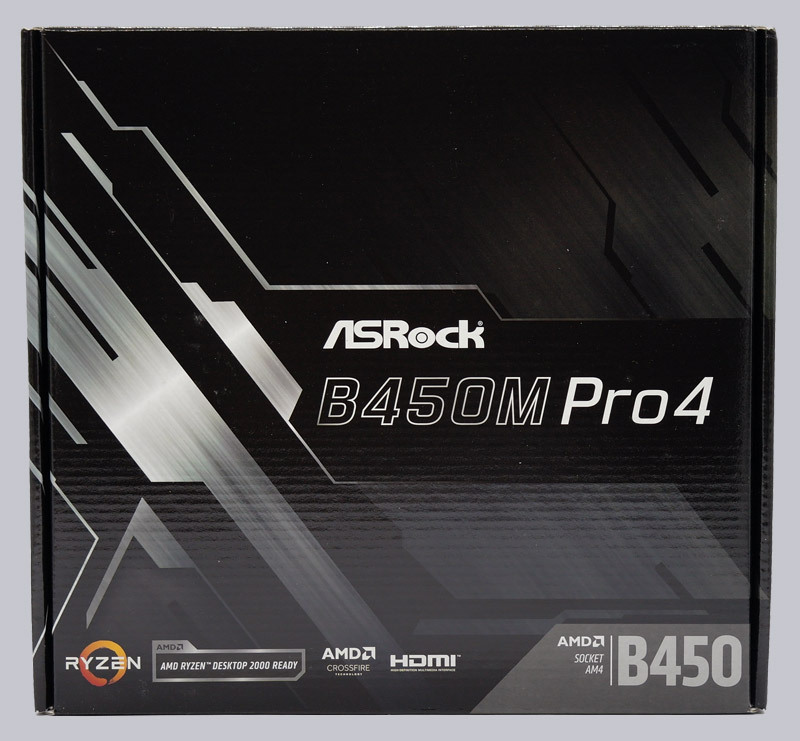 Let us see, which features the ASRock B450M Pro4 motherboard has to offer and how high the AMD processors were overclocked. It is not only a motherboard test, but also a test of the AMD Ryzen 5 2400G, AMD Ryzen 7 2700X and AMD Ryzen 7 1800X AMD AM4 CPUs. Furthermore we dared an experiment with the new Arctic Alpine AM4 passive CPU cooler and wish you as always a good time on OCinside.de! 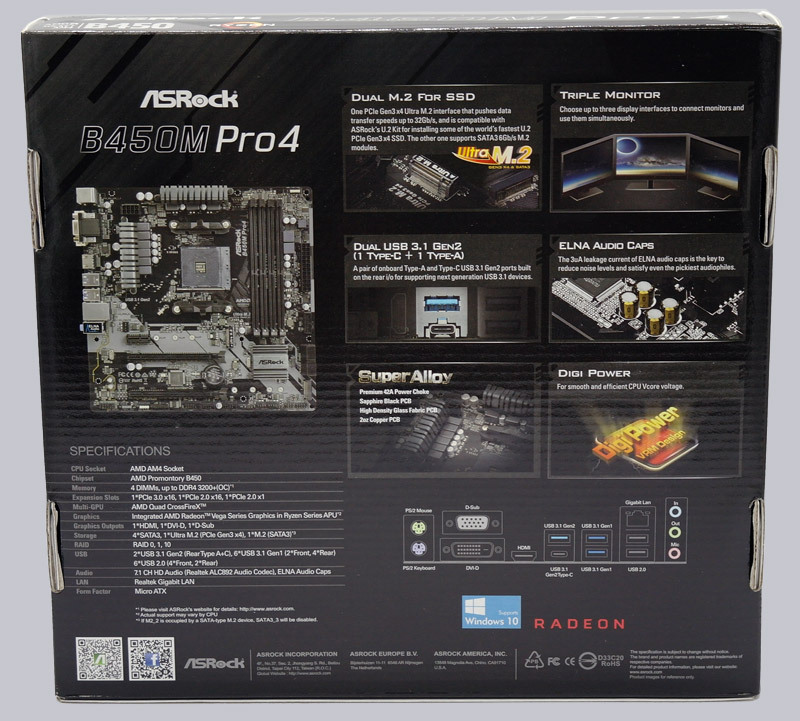 This is the small mainboard box of the new ASRock B450M Pro4 AMD Ryzen motherboard. 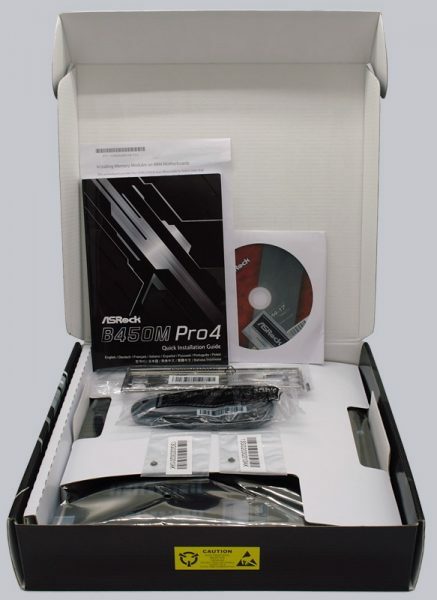 The back of the package already shows some features like Dual M.2, Dual USB 3.1 Gen2, Super Alloy, three monitor connectors, ELNA Audio Capacitors and Digi Power. After opening the box, the accessories appear first. The ASRock B450M Pro4 AMD AM4 motherboard included a manual, a DRAM installation sheet, a DVD, two SATA data cables (angled and straight), two screws for the M.2 sockets and an ATX I/O panel. Additional USB slot covers or an ASRock USB 3.0 front panel are optionally available. This is the look of the new ASRock B450M Pro4 motherboard.